I have a love affair with coffee. It all began in Rome, June 1990, at the Hotel Smeraldo. The signora would make café latte in the morning and it was ambrosia. No matter what time we had rolled in the night before, Mimi and I would set our alarm clock to make sure we did not miss the breakfast service at the hotel. Cafe latte, cookies, nun buns and jam. I have stayed in hundreds of hotels since my first stay at the Smeraldo and not one of them serves a café latte that even comes close. The best place to get a coffee is at a cafe - preferably one that serves ALOT of coffee. It is believed that the more a machine is used, the better the coffee will be. So don't be put off by a crowd at the bar. This is a good sign and the baristas in Italy move with an efficiency that would humble the dude at Starbucks. Here is a primer on how to order. 1. Scuro “dark”. Cappucino scuro has extra espresso in it. If you order your cappuccino with an extra shot in the US, this is the way to go in Italy. 2. Al vetro “in glass”. Some Italians have a preference that their espresso (or cappuccino) is served in a glass rather than a ceramic cup. Sometimes the espresso will come in glass regardless but if this is your preference, make sure you specify. 3. Tepido “lukewarm” Italians have a fear of beverages that are either too cold (no ice, please) or too hot. The ideal temperature of a cappuccino in Italy will be lower than what you might expect here but if you want to make sure that it is immediately drinkable, go for “tepido”. 4. 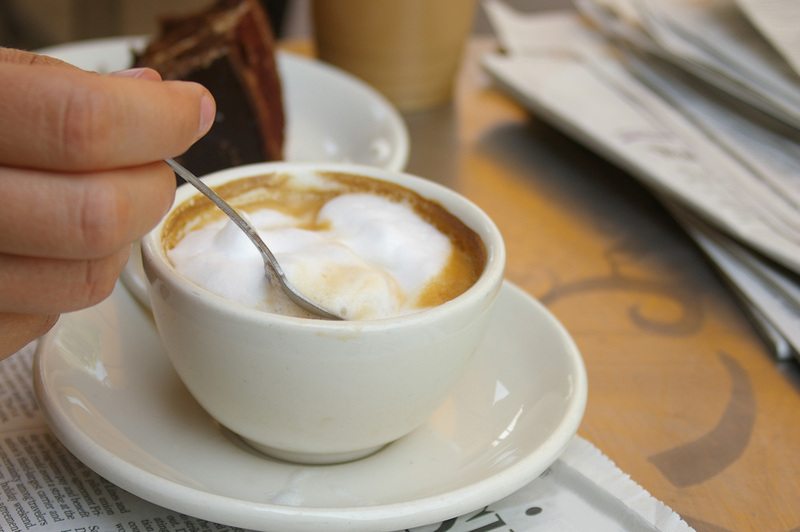 Ben caldo – “good and hot” - on a blustery January day this is how I order a cappuccino. There is something so comforting about taking a break in a cozy bar after a morning of sightseeing. The counter is buzzing and you can people watch while you wrap your hands around a steaming cappuccino. Heaven! 5. Ristretto – “restrained” Somehow this has something to do with how the shot of espresso is made. It makes it much more intense. You will usually see a well-dressed Italian businessman with a cigarette and a newspaper in hand drinking this. 7. Latte macchiato “stained milk” - a steamed milk with a drop of espresso in it. It is usually how kids start drinking coffee in Italy. The opposite of this is a café macchiato (stained coffee) which is an espresso with a drop of milk. A good option for those who are not quite ready for a straight espresso. 8. Corretto “corrected” – what better way to “correct” an espresso than to add a shot of grappa to it?!? I know, it sounds intense but it is an option and I can see it being useful in 2 ways. 1) it warms you from the inside out which makes it a perfect option for those Alpine shepherds heading out to work in the Dolomites. 2) it cures what ails you. I drank a corretto one evening after a long day of travel during which I came down with a brutal cold. The next morning, the cold was gone and I was back on my feet. True story. 9. Americano “American”. Don’t expect a brewed, percolated coffee. The barista takes a shot of espresso and fills the cup with hot water. 10. Con cornetto – the BEST way to order a coffee. With a croissant, but only at the right café that makes pastries that are worth the calories. I love the lemon and pistachio or multigrain with honey. It’s an indulgence that I permit myself once per trip. YOLO, right? ?